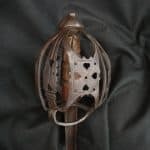 A fine quality North German Rapier dating to the early 17th century. 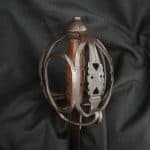 The elegantly contoured cradle guard is built with an intricately pierced double shell guard base and sides formed from delicately forged bars and scrolled quillons. 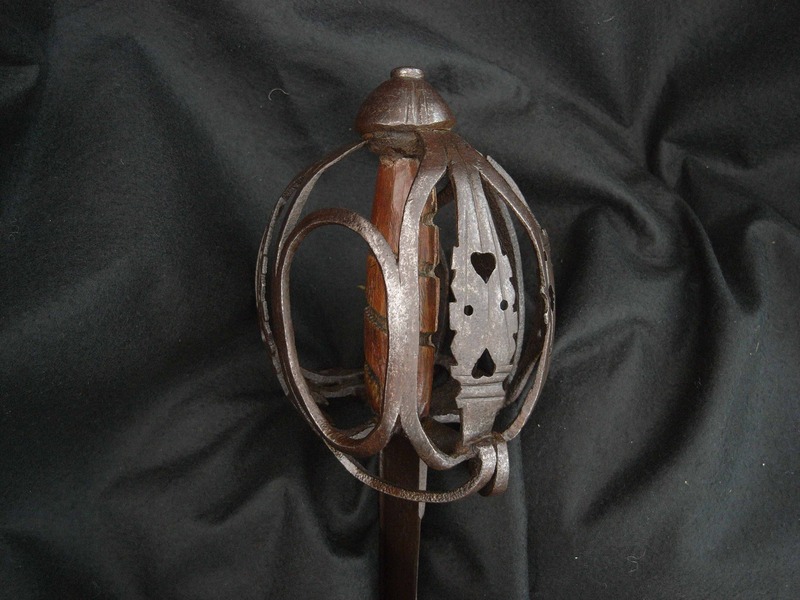 The grip is bound with twisted wire and the onion shaped pommel vertically fluted with stylish grooves. 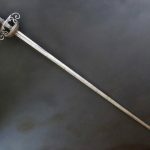 The blade is of exceptional quality and retains its full length with clear makers marks on both sides. 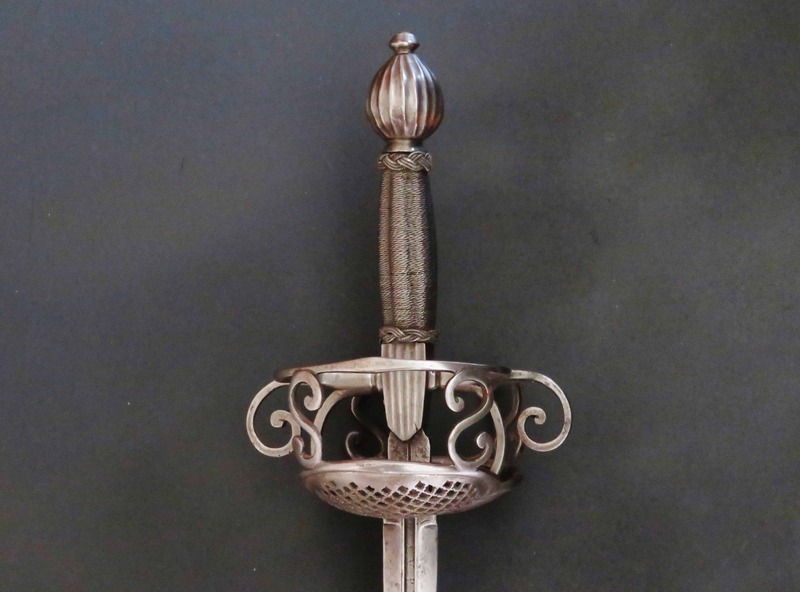 The rapier is in excellent condition and exhibits an attractive antique sheen all over. 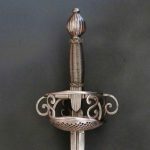 The complex hilt is formed from finely worked rectangular and square section bars of varying widths with rounded edges, formed around a robust vertically fluted quillon block, shaped with downward facing triangular langets, which hold the blade tightly in place. 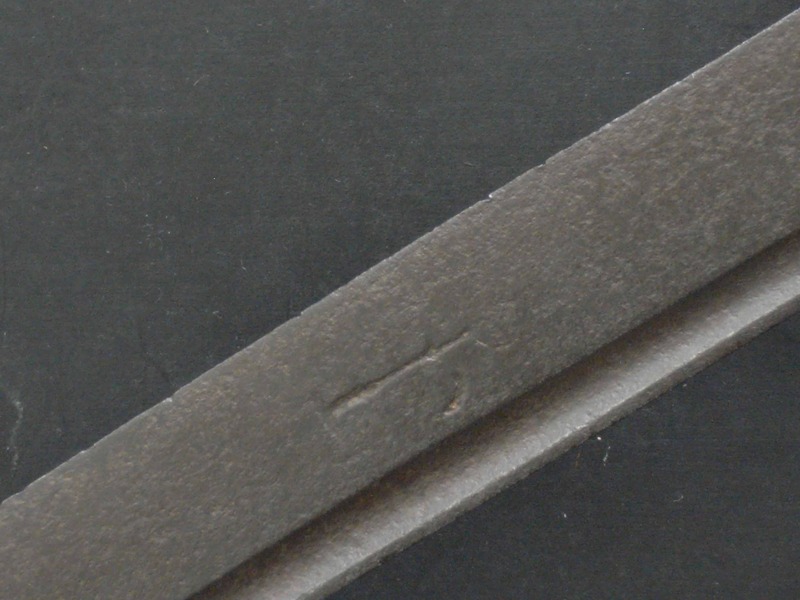 Two horizontal quillons emanate from the block to form a cross guard and terminate in downward facing scrolls with swollen ends. 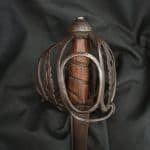 From the centre of the cross guard two horizontal guard rings are forged from between the quillons with swollen middles. 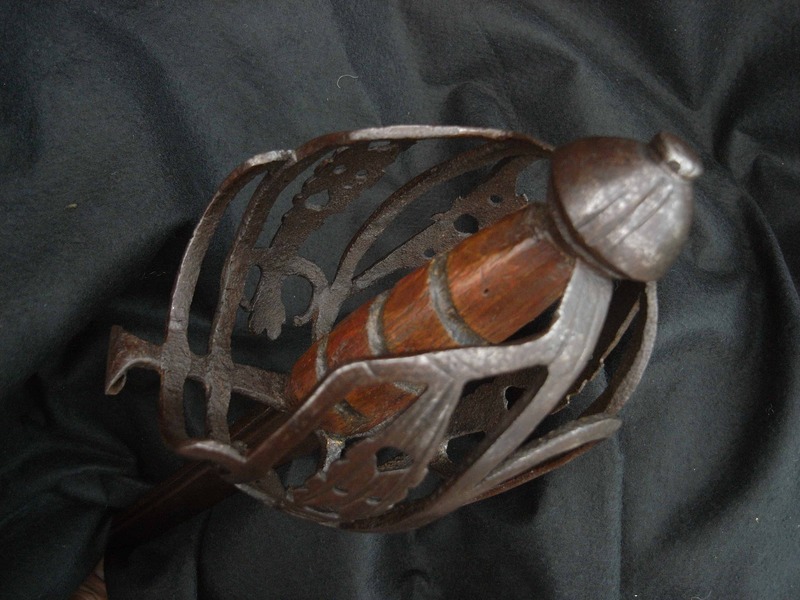 Underneath, two pas de ane rings curve from the block in convex manner to meet a secondary cross guard bar below, on to which is attached two smaller, horizontal, shell guard rings, each infilled with a sprung guard plate, finely pierced with a lattice of delicately fretted stylised squares of exquisite workmanship. 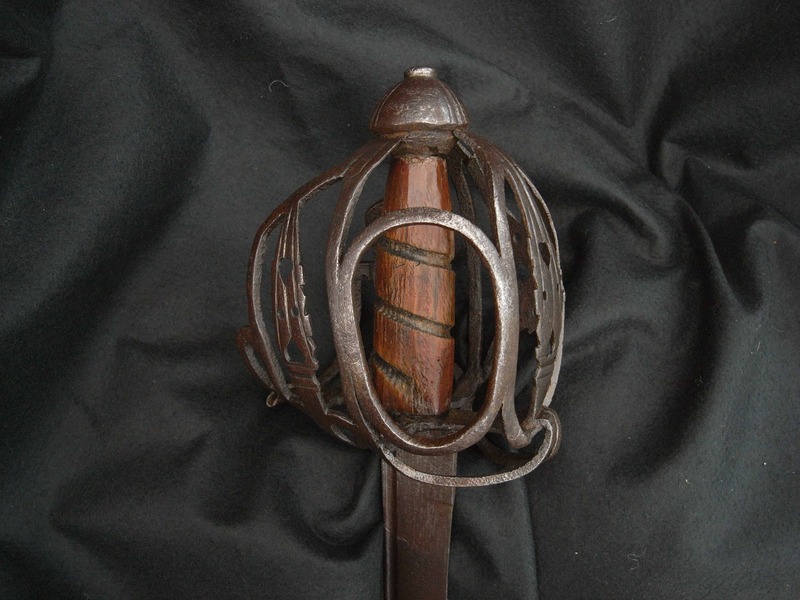 The strength of the attachment of these rings to the primary guard rings above is reinforced by the addition of four “S” shaped connecting bars. 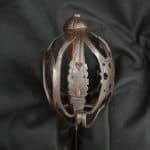 The onion shaped pommel is formed with an integral button and flared neck. 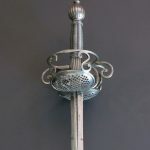 The pommel is filed with decorous vertically fluted grooves and ridges similar to those of the quillon block. 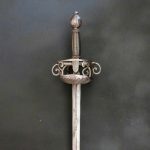 The blade is of excellent quality, of stiff diamond section, with flattened ridges. It possesses a short ricasso and tapers to its point. 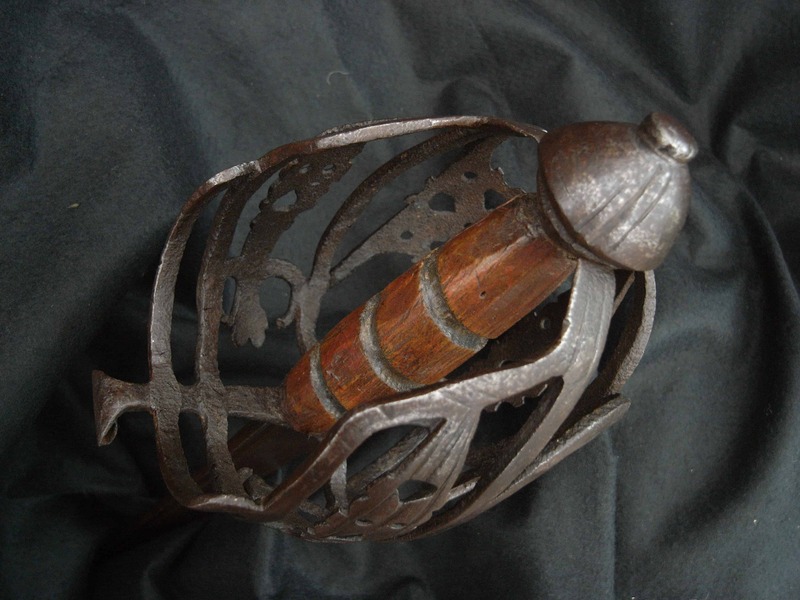 From the hilt, either side, a central tapering fuller extends for 5 inches (10.25 cm) from the hilt. 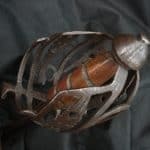 At the hilt, the shoulders of the ricasso either side of the fuller, are cut with “thumb nail” marks. 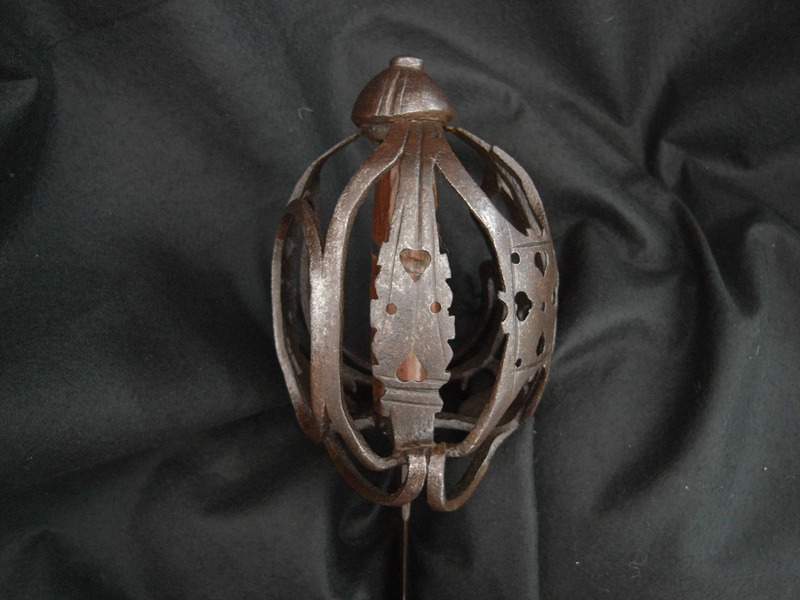 Along its flanks the fuller is incised either side with narrow delicate lines interspersed with rows of dots. Inside the fuller on one side is the mark: L V P V S A U G U L A and on the other: I R S V S M A R I A , both inscriptions interspersed with dots. 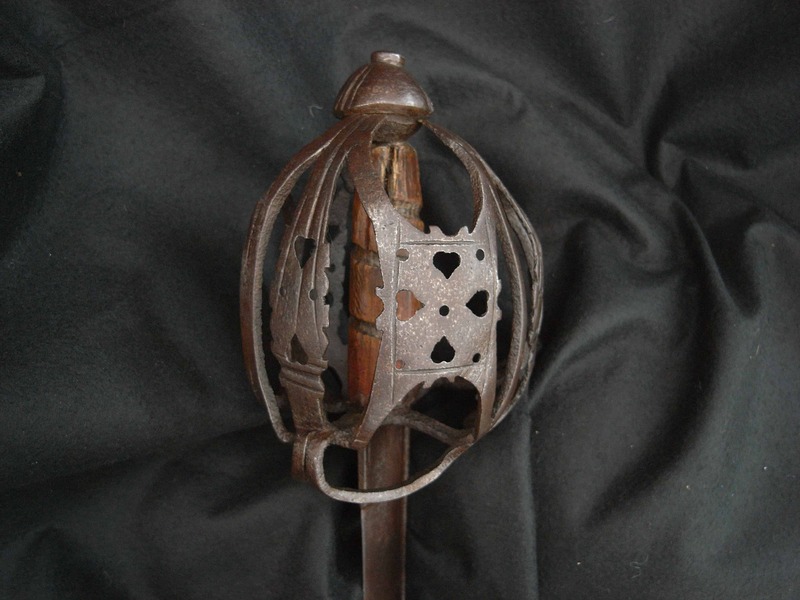 At the end of the fuller either side a stylised cross is punched into the blade. 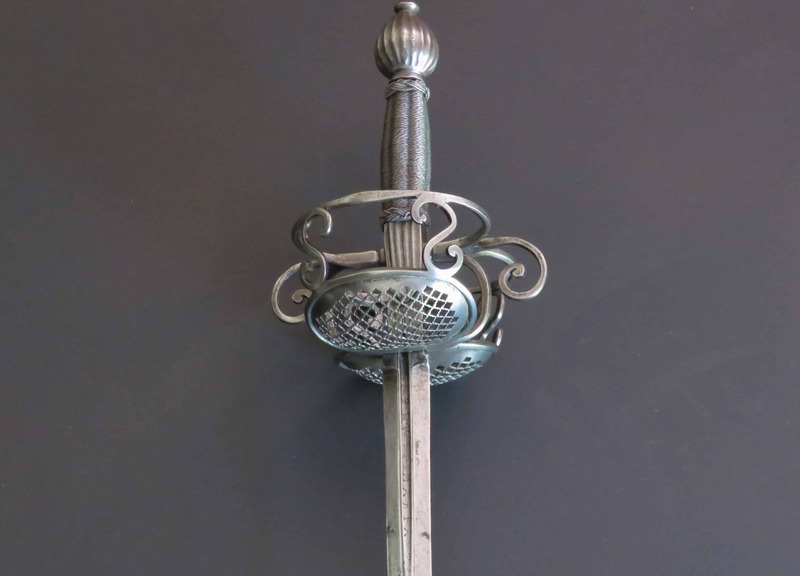 The blade is probably of Northern Italian origin, manufactured by a Toledo trained smith working in an area under Spanish control, possibly Milan. 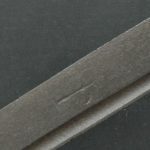 The uninterrupted taper shows that the blade retains its original length. 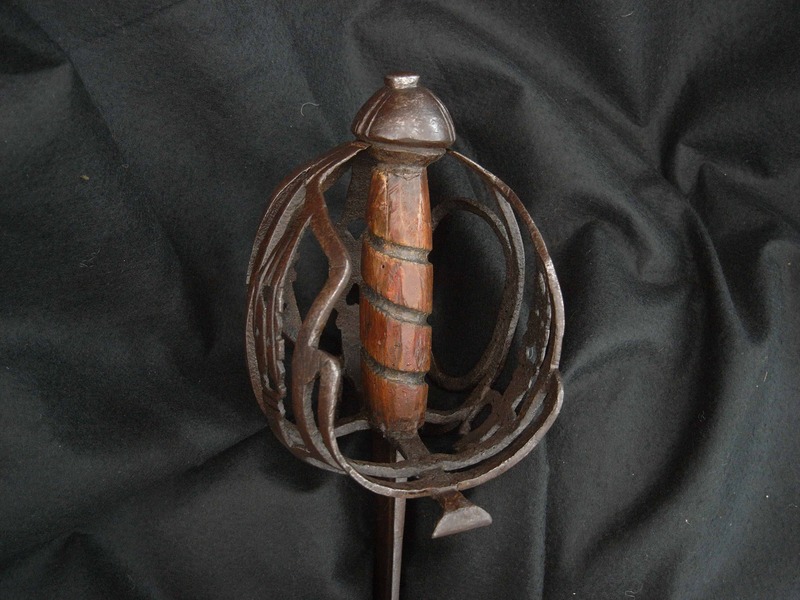 The wooden grip is vertically fluted and covered with a decorative wrap of bands of twisted wire with “Turks Heads” top and bottom. 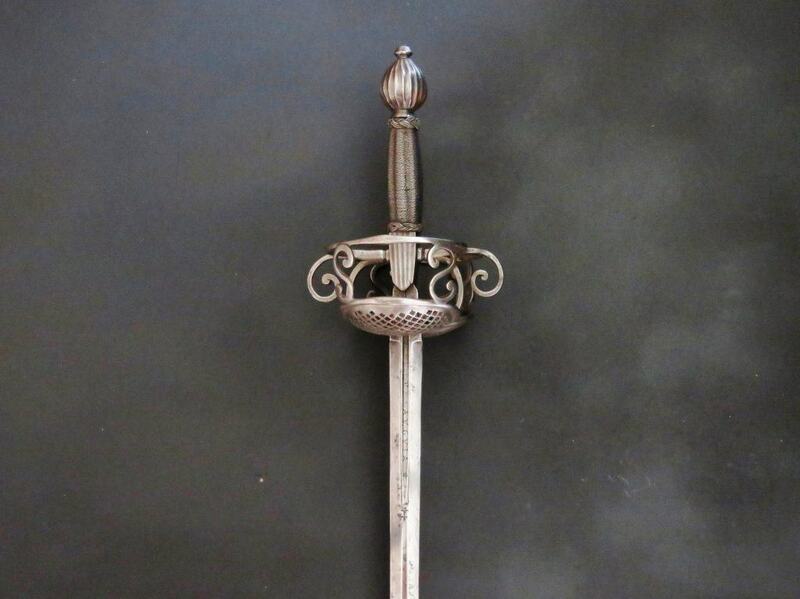 The sword is in fine condition, its parts tight together, well balanced and lovely to handle. 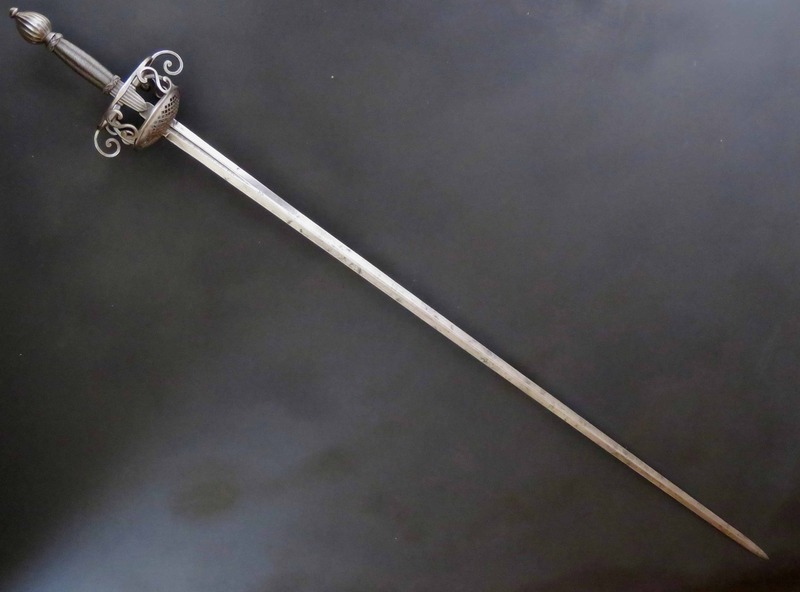 The blade length is: 41.25 inches (105 cm) and overall is: 49 inches (125 cm) long.